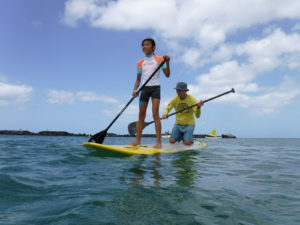 PAHOA, Hawaii Island — At a picnic table in a sprawling improvised complex of tarp shelters, Howard Konanui sat with new friends, wrapping plastic forks, knives and spoons in paper napkins. Konanui’s home was among more than 600 lost so far to the volcanic eruption in Lower Puna. 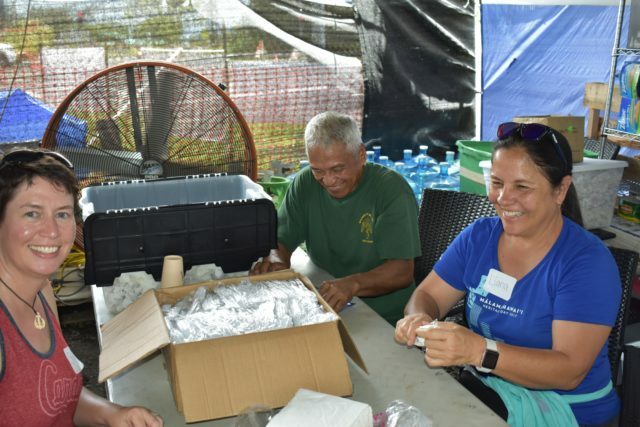 He’s filling his days by helping other lava refugees at Puuhonua O Puna, also known as the “Hub”: a small city of tarp shelters, pop-up tents and shipping containers that’s grown up on a vacant lot across from the Pahoa Intermediate and High School complex. Kapua Freitas, 8, right, offers an evacuee a choice of dog leashes. The Hub isn’t a homeless encampment. 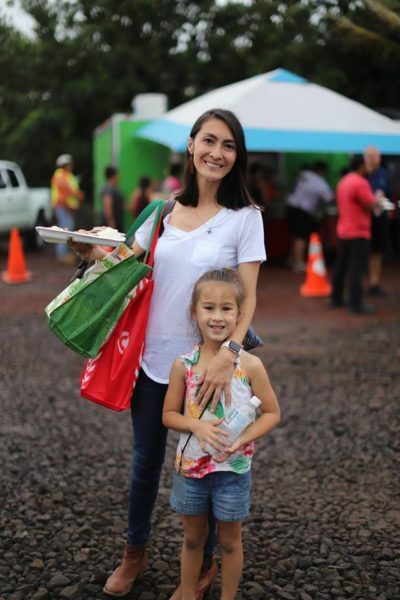 It’s a place where lava refugees can come for nearly all their needs besides housing: hot meals, groceries, personal hygiene products, clothing, blankets, mattresses, even a hot shower and a massage — as well as health care, information, shoulders to cry on and a sense of community. 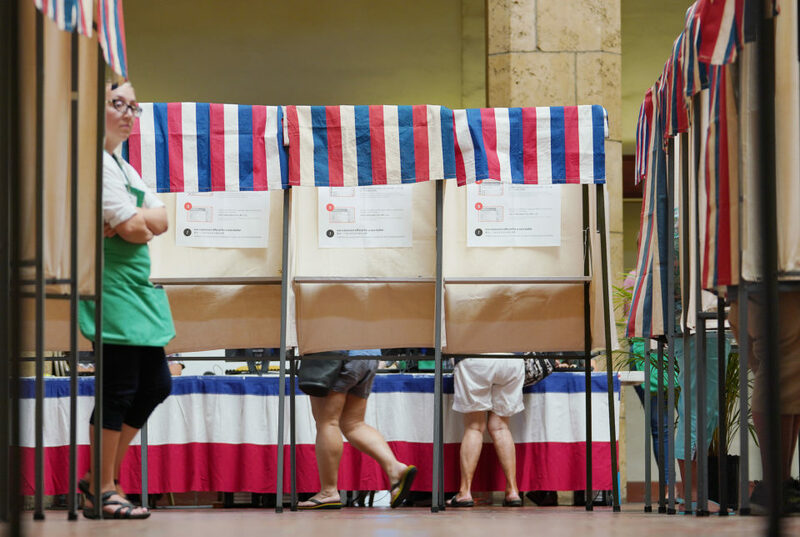 It’s been organized, built and staffed not by Civil Defense, the Red Cross or any other governmental or nonprofit organization, but by Puna residents themselves. 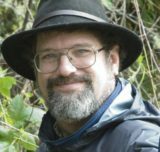 Before the latest eruption, it didn’t exist, even on paper. 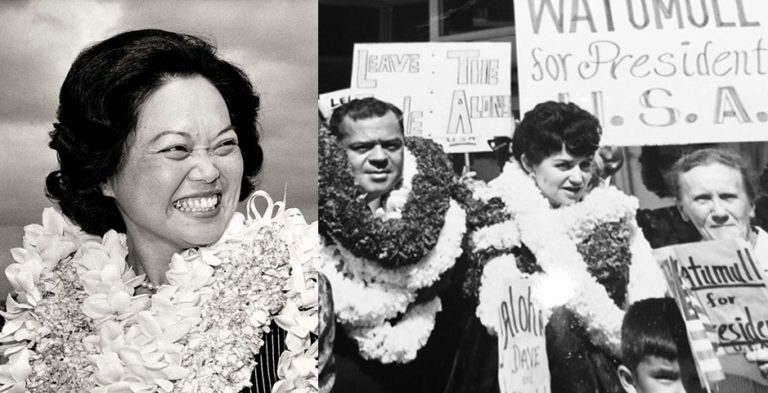 The Hub’s more formal name comes from the Hawaiian custom of puuhonua: places where defeated warriors, noncombatants and those who had fallen afoul of ancient Hawaii’s kapu system could go for refuge, rehabilitation and absolution. Ashley Kierkiewicz and her daughter, Arya. Kierkiewicz has been a driving force behind Puuhonua O Puna. 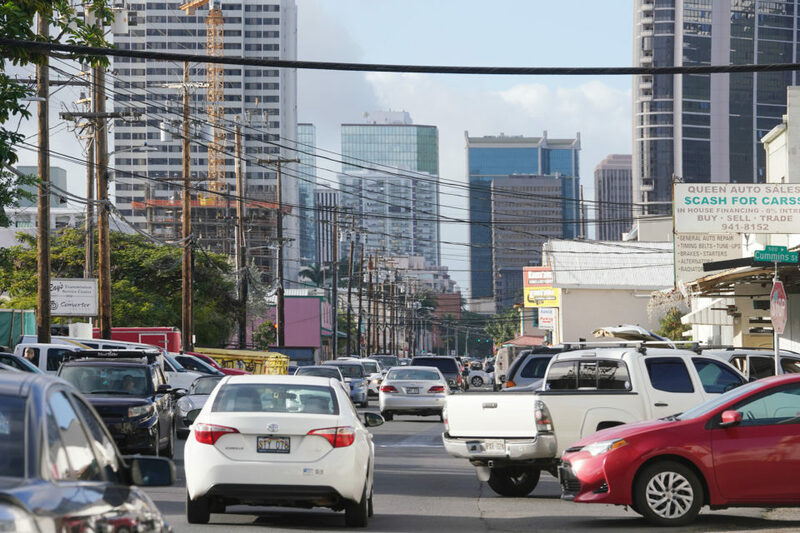 Although it’s the product of many minds and hands, the spark plugs were probably Ikaika Marzo, who’s been doing live daily videos of the eruption, and a young working mom named Ashley Kierkiewicz. Shortly after the eruption began, a group including Marzo amd Kierkewicz met with Robert Aquinaldo, who owned an ungraded lot just outside Pahoa, with the idea of establishing a community meeting place and distribution center to aid evacuees. “We met at 12:30. Gilbert started bulldozing, and by 4 p.m, we had set up canopies and tents and had begun accepting donations,” Kierkiewicz recalls. Help and supplies poured in from local residents and businesses. Conen’s Trucking, Big Island Containers and Puna Geothermal Venture loaned the Hub 20- and 40-foot shipping containers to hold the donated supplies; others donated shipping pallets. When rain threatened to turn the site into a mud bath, word went out on the internet and residents and businesses showed up with truckloads of gravel. Online request lists of needed supplies — everything from blankets to cat crates, diapers to denture adhesive — posted at the group’s Facebook page and its Amazon Wish List, have drawn such an enthusiastic response that for a few days last week, the Hub had to suspend new donations until it could free some space in its containers. Volunteer response has been equally enthusiastic, and nearly as diverse. 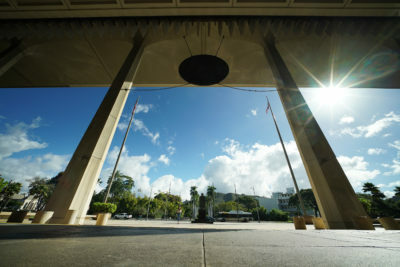 As word of the crisis and the group’s own reputation has spread, people have flown in from across the state, from other states and even Japan to volunteer, Kierkierwicz said. “I was contacted by a woman who has corralled her entire family into celebrating her 71st birthday by flying into Hawaii and volunteering at the Hub,” she said. The group has established an online site where people can sign up to volunteer on a given day. At a table near Konanui, 8-year-old Kapua Freitas was scooping dog food into gallon plastic bags and handing them and other pet products out to evacuees. She pointed to a table where volunteers were passing out personal hygiene products. 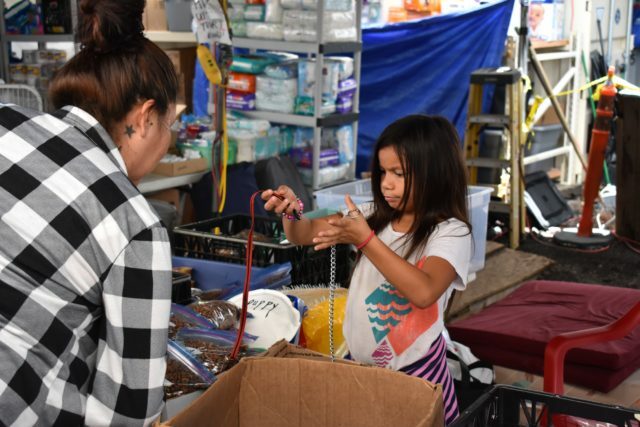 At other stations, they were distributing clothing, bedding, children’s toys, camping equipment, baby supplies, dining and kitchen utensils and canned goods. Volunteers, from left, Stacy Bacon, Howard Konanui and Diana Honda prepare plastic flatware packets for lunch. Out in the unpaved parking lot, Kapua’s father, John-Jon Freitas, was directing traffic. 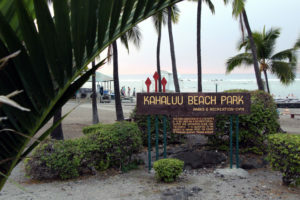 He noted proudly that Kapua and her older brother, Kamala, “gave up their summer to help the community,” though he does reward them with occasional days at the beach. The Freitases live in the nearby subdivision of Hawaiian Beaches, which is untouched by lava — at least, so far. 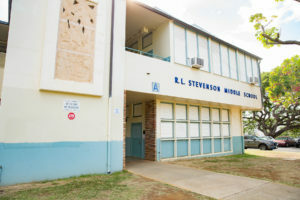 Across the parking lot, the Ieie Mobile Shower Service trailer, on loan from a nonprofit called Project Vision Hawaii, offered evacuees a chance to get clean. 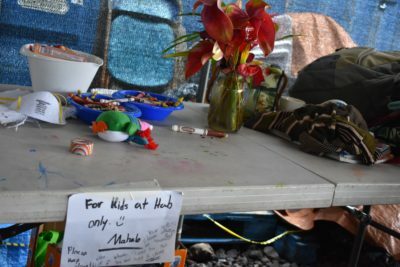 In the tarp shelter next door, Max Foster signed them up for the services of several masseurs and acupuncturists, there to un-knot tense muscles as part of the Hub’s Aloha Friday Health and Healing Village. 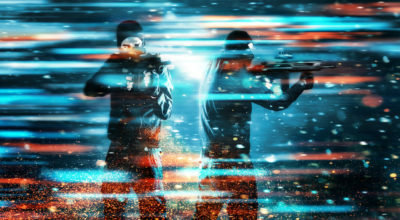 Services offered vary from week to week. This Friday, for instance, the Health and Healing Village will host a mobile vision clinic staffed by two eye doctors from Oahu. Three times a day, evacuees gather for hot meals. Usually, they’re cooked by the nonprofit World Central Kitchen at a former restaurant in Pahoa. But volunteers and local restaurants also often donate hot dishes, and occasionally there are guest chefs or cooking crews from various businesses or organizations. Rory’s Kitchen, a Thai restaurant in Pahoa, brings food once a week. One day, local Walmart employees showed up en masse to help. On another day, it was a crew from the Animal Planet TV network. Another key service the Hub supplies has been, simply, interaction with aloha. Some of the people helping at the Health and Healing Village, for instance are there just to talk story with evacuees who need to unload. The Carrolls last saw their home in early May, when volcanic cinders were raining in their yard and a crack had opened in their driveway. They think it’s still there, but they can’t return, and their insurance company has refused to pay while the home’s still there. Lynda Carroll took comfort just in seeing some of their former neighbors sitting at a nearby table. As the crisis grinds on, the volunteers at Puuhonua O Puna are settling in. They’ve started applying for 501(c)3 nonprofit status so contributions can become deductible. They’re raising money for two more mobile shower units. A children’s play table at the “Hub” holds toys, crayons and ash masks. Kupuna at a local care home are sewing pillowcases for the new micro-housing units that Habitat for Humanity members and local volunteers put up on land loaned by a local church. More such units are planned. 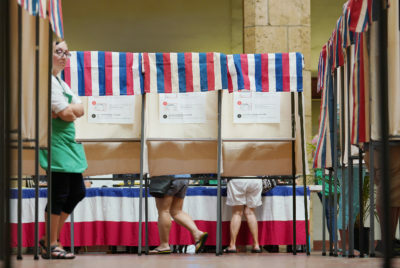 Kierkierwicz, who is a candidate for the Hawaii County Council in District 4, worries that “kokua fatigue” will set in as the lava keeps flowing but so far, the community’s sense of aloha has triumphed.